Ultrasonic Cool Mist increases air moisture for easier breathing and a good night sleep. 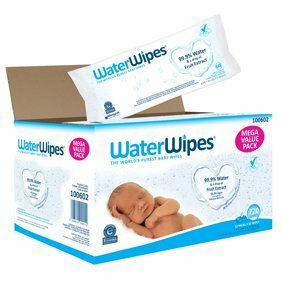 I read the reviews on this product before purchasing. It has performed wonderfully. I was looking for a humidifier that turned off automatically when it ran out of water, one that had a large enough reservoir to run though the night and one that was not loud or had a smell from the filter. This humidifier has performed well with all of my requirements! It has helped me greatly with my sinuses and the dry air that accompanies the winter. I would definitely recommend! The mister is easy to handle for filling and cleaning. Its controls allow for the delivery of a high level ol cool mist that may actually leave a surface damp or adjustment to a very small amount of mist at its lowest level. In my opinion it is important to have this wide range available. The delivery is gentle. Some misters seem to blow a little moisture without much affect. This Crane model delivers several levels of moisture directly and comfortably. This is the second one I have had. The first one was purchased over a year ago and is still in excellent condition. Except for the little gurgle as the water enters the basin, this baby is SILENT! Perfect for even the lightest sleeper. I've run it continuously since purchase, at varied settings; With medium setting it easily runs 24 hours but even at highest setting, it lasts overnight. Similarly, no condensation or moisture near or below unit no matter the setting. The positioning of the tank handle makes filling a bit tricky since it can't sit on a flat surface, but I've found, by removing my drain strainer, it fits nicely in the sink with no concern of damage to the handle. Not an issue, really, unless person had an injured or weak arm/hand. We have extremely hard water, so I noticed mineral build-up in just a couple days. With daily rinse and wipe, plus recommended vinegar soak weekly, not a problem. 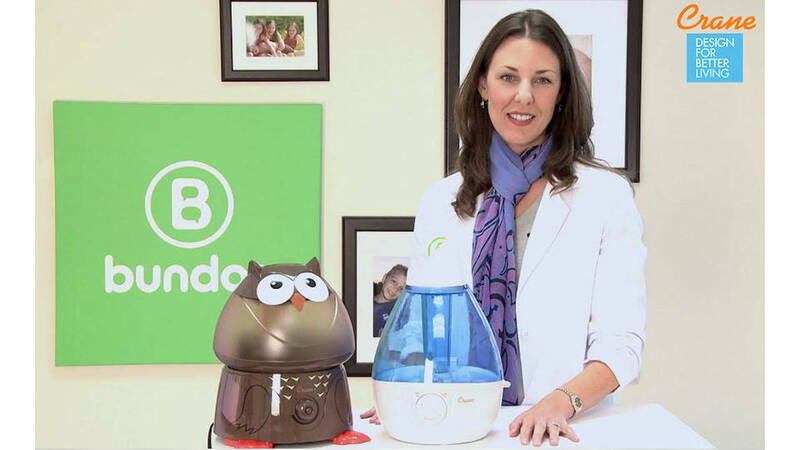 a good intermediate priced humidifier. I like that it produces very small particles of moisture; without using heat, and has a quiet performance. The only undesirable and unexpected downside is that the instructions specify not to set on the carpet or on a table. So I am trying to figure out what I can set it on. I'm glad I didn't order a larger humidifier; because even this one is a little difficult to fill with water and carry to location. But I like everything else about this humidifier. I love it! Our old one was very noisy and when I plugged this one in and turned it on my husband said, "It's broken." I replied, "No it's not. It is whisper silent." He said he was joking. After living with our old one for so long it was amazing how you don't hear anything from this one! Best humidifier I have ever owned! 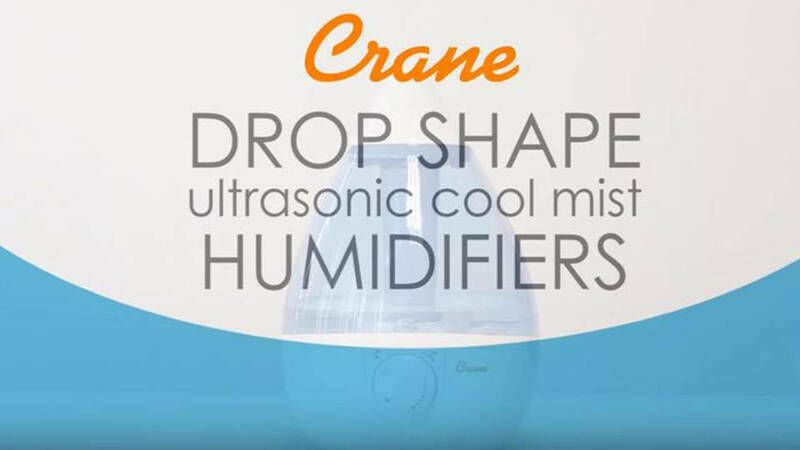 I purchased one of these Crane teardrop humidifiers a year ago and used it all winter long. I loved it so much that I bought a second one for another room. They are GREAT! Easy to clean and pretty quiet. I have one sitting next to me on the nightstand. They really put out a lot of vapor. I followed the instructions on how to set the mist so that I don't get any white residue all over. I highly recommend this brand and this model! Thanks Crane! My Crane, Model EE-5301W cool mist, room humidifier is very silent and maintains the room at a comfortable moisture/temperature level. 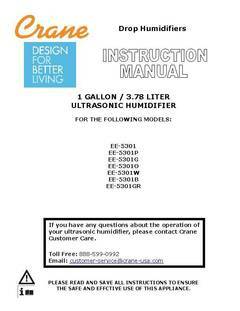 The accompanying Instruction Manual is very concisely and clearly written for upkeep and maintenance. I am very pleased with this purchase; after one month of nightly usage. I wanted a small, quiet humidifier that didn't use a lot of water as I empty this every morning. 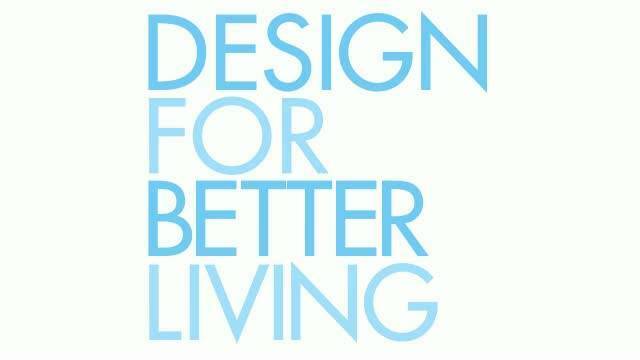 Emptying it daily will keep it cleaner and not require a lot of maintenance. I am 60 yrs old and have a lot of dry skin problems and also wake up with dry throat and so far I like this humidifier. It is lightweight and easy to fill and empty. I like the small green light and it has a slight hum that doesn't bother me at all and I am a light sleeper. I use this for my bedroom. I would recommend this product. Ordered this humidifier after my old one finally quit. The shape is very modern and the unit works great and is extremely quiet. Cool steam is instantaneous and really helps when the air in the house gets dry from heating in the winter. I would recommend this unit although the price is a little high. I like that the Crane humidifier is so quiet and puts out lots of mist. However have initially been using in small office, keeping on ceramic tiled floor. The problem is that the floor becomes very wet around the unit. I would be concerned to place this on a dresser or chair, as recommended, for fear that it would damage the furniture. If I had this running over a rug, I may not have noticed the moisture until the rug started to develop mold.